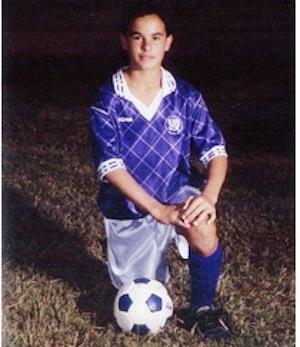 The latest edition of our "When They Were Children" series looks at Landon Donovan's childhood soccer experience. Josh Donovan was 5 years old when he got a brother. The family newcomer, Landon, started walking at about 10 months old. "That was about the time he started playing with the ball," said his mother, Donna Kenny-Cash. "Josh couldn't wait for Landon to stand up and start playing soccer with him." Donna signed up Landon for an AYSO team at age 5 and he scored seven goals in his first game. The only other organized sports Landon played was a little T-ball and cross-country in high school. "But I played every sport you could imagine during my whole childhood," he said. "Anytime we had a chance to go outside and play, we did. "Usually what happened is whatever sport was in season, we'd go outside and play. So if the NBA playoffs were going on, we'd go outside and play basketball. If baseball was starting, we'd go play baseball. If it was hockey, we'd play hockey." But soccer enchanted him most. Donovan even continued playing Southern California AYSO ball years after he joined a club team, whose coach Clint Greenwood recalls just how energetic a boy Donovan was. Aside from often coming straight from AYSO games to play for his club, Greenwood said Donovan would run three miles from his house to practice -- and turn down a ride if offered. "First of all, I have a lot of energy," said Donovan in a 2010 interview. "I'm always moving and going. Especially when I was young, I was just very determined and I always wanted to push myself, and that was one example." Greenwood’s team, Cal Heat, comprised primarily of Latino players, created an environment in which Donovan says he flourished. ''His theory was absolutely perfect: As a kid, you need to touch the ball as much as you can," Donovan told me in a 2006 interview. "You should always be with the ball. You should have a feeling that wherever the ball is, you can do anything with it. No matter where it is, where it is on your body, how it's spinning, how it's coming at you, the speed it's coming at you, anything. Donovan was noticed by the Olympic Development Program (ODP) and his appearances for the U.S. U-17 national team led European teams to court the teen. Donovan came home after a homesickness-plagued stint with Germany’s Bayer Leverkusen, but he had won the Golden Ball MVP Award at the 1999 U-17 World Cup in New Zealand, where the USA finished in a historic fourth place. At age 19, he led the San Jose Earthquakes to the 2001 MLS Cup title. ''Before my first MLS final, I thought to myself, 'I can't remember ever winning anything with my club teams growing up,'' said Donovan when we spoke about youth soccer in 2006. “Honestly, I know it sounds weird at 12 years old to know nothing about the World Cup, but I really didn't even know the concept of it. Then I went to the Argentina-Romania game at the Rose Bowl. Donovan ended up playing in three World Cups, helping the USA to its best finish of the modern era at age 20 when the Bruce Arena-coached USA reached the 2002 quarterfinals. Donovan famously scored the stoppage-time goal against Algeria that qualified Coach Bob Bradley’s squad to the second round in 2010. Donovan also represented the USA at six Gold Cups, the Confederations Cup, the Olympics, and the U-20 World Cup. He has won five MLS Cups going into the 2014 playoffs and holds the record for most goals and assists in MLS and U.S. national team history. And it all started when an older brother eagerly introduced the ball to a boy who had just learned to walk. MLS 2014 SuperDraft Picks: Andre Blake, Steve Birnbaum, Christian Dean, Steve Neumann, Eric Miller, Damion Lowe. 10 comments about "Landon Donovan's Path to Greatness". cony konstin, October 24, 2014 at 12:33 p.m. There is something deeply wrong here. If this was Brazil do you think they would do what is being done LD to Pele. No way. LD is national treasure and what is happening here is a disgrace. I have been coaching for 40 years and I can't believe what has been done to our national treasure. We will be waiting a long time for another LD. Especially because the soccer environment of a pay to play model is an abomination. We need a soccer Revolution in the USA. If we want more LDs than we need to build 600,000 futsal courts so kids in our inner cities and our suburbs can play starting at age 5, for free, 3 to 5 hours a day, 7 days a week, with no adult interference, and 365 day a year. Long Live LD Long Live the greatest USONIAN soccer player of all time. Kent James, October 24, 2014 at 1:46 p.m.
Every coach needs to know LD's development history. While clearly LD is a special player, he knows what is important; ball skills and a variety of sports when you are young. Not intense competition, not an emphasis on winning, and not a lot of tactics. Those can all come later. Players need to want to play on their own, and for that to happen, it has to be fun. I think it's great that Donovan continued to play AYSO even after he started playing for a competitive team. It is important to have an opportunity to be creative in an atmosphere where its okay to make mistakes (pick-up is a good option), and I would guess the AYSO experience continued to help with his development, even when he had more competitive options. A balance is important. Allan Lindh, October 25, 2014 at 7:03 p.m.
Futbal is a game, a beautiful game, a kids game, it only matters if it's fun. LD gets that, Jurgen Littleman never will. Viva el Donovan. And if you want the game to flourish in this country, buy a #3 or #4 ball and take some little kids to the nearest park to play. And when they are done, give the ball to the one who loved it the most. Repeat as needed. Alex G. Sicre, October 25, 2014 at 7:54 p.m. Excellent comments from Cony, Kent and Allan. Like me, he is from Southern California, and has played extensively with Latino players. After every Galaxy game, he is interviewed by Mexican TV commentators in Spanish. I am also bi-lingual and was amazed at his understanding and ability to speak Spanish to the Mexican press. Viva Landon, forever and ever. I will miss watching him play in the future, and to me The Galaxy and the USMNT will not be as exciting without him on the pitch. Daniel Clifton, October 26, 2014 at 7:29 p.m. This was a great article to read. LD is so right about how youth soccer must change in this country. All the commenters before me have said it like it is. I coached a little bit of competitive soccer and I could not believe he attitude of so many of the parents: Winning is everything. When I was trying to work on development a large number of them was wondering why our winning record wasn't better and why I wasn't yelling at young girls to inspire them to play better. Landon as it right. After reading this piece I am even more disappointed with Klinsmann's decision to leave LD off the World Cup roster after the fact. Mike Jacome, October 27, 2014 at 4:03 p.m. Cony...I agree with you that what was done with Landon, has been an abomination. I wish from the bottom of my heart that you are wrong about the time we should wait to get the next Landon Donovan; hopefully a pair of them. Rick Estupinan, October 27, 2014 at 8:07 p.m.
a 2 - 0 result. Rick Estupinan, October 27, 2014 at 8:50 p.m. The best referees are the ones who do not stop the flow of a good game because some crying 'baby'falls on the floor, rolling two or three times with a big open mouth,like he is near death,and a minute later you see him running as if nothing ever happened to him.Some referees ignored this kind of NOT MANLY BEHAVIOR,and this shameless individual get up and just keep running because he knows he couldn't fool the ref. Unfortunately,it seems to me that Paul Garner,likes this kind of 'softies'referees.In the game between LA Galaxy and the Seattle Sounders,he says that the ref of that game Griger,should have given second yellows to Dempsey,Alonso and another Sounder player.Can anybody imagine this?,is there any other way to kill a game ?.But PG.would have like that. tommy mcleod, October 28, 2014 at 10:38 p.m.
America is a great country with wonderful people.baseball basketball football are americas sports.but when it comes to soccer ?granted it as a young sport in America and the people are getting to enjoy it and some love it but there is a lot left to be desired whoa it comes to understanding it,.to rake Klinsmann over the coals for his "treatment of Donavan absolutely ridiculous..in all professional sports there is no such thing as sympathy which Donovan was obviously lapping up and showing his no class. Have used on Donovan.not once did Donovan say that Klinsman was the could and should do what he thought was best for the team. A wee girl methinks . I myself am a former pro soccer player inScotland England and the U.S..
And am really enjoying the baseball. Brian Something, October 30, 2014 at 10:04 p.m. It seems that special players like Donovan and Clint Dempsey evolve despite our dysfunctional "development" system, not because of it.